Introductions + group problem solving with your peers. Come ready with a top of mind challenge. Turn your biggest challenges into questions for our guest speaker. A detailed look at the event. As a part of the Fintech week, QuantUniversity is proud to offer the first Data Science for Finance Crash Course. The goal of this course is to offer data science and fintech enthusiasts a hand-on practical case study to understand the power of Data Science in Finance. 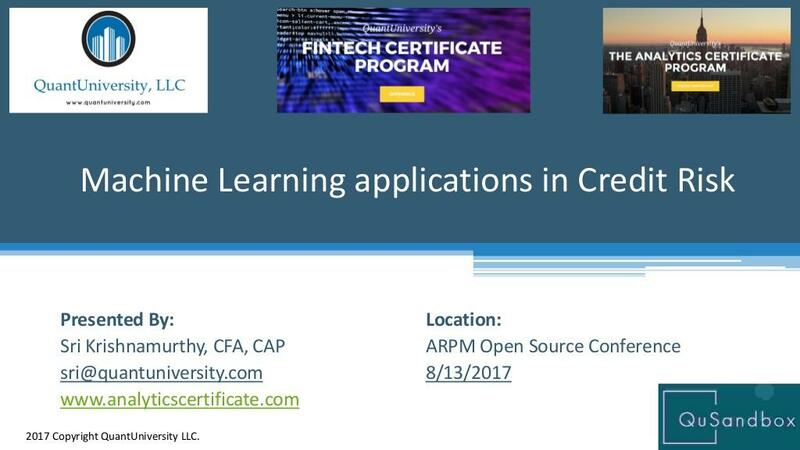 We will be using the Lending club data set to build a credit risk model using machine learning techniques. Python experience is not required to attend the course but useful. We will be posting additional reading materials as we get close. 2. Please plan to attend all sessions. We will plan to stream this class live and also record it. 5. To be eligible for the certificate, you will have to record a 5 min You-tube video demonstrating that you completed all the 4 labs. The course is OPEN PRICE. We are charging a minimum fee to cover administrative costs for the certificate and to subsidize students through the QuantUniversity's "Analytics for a cause initiative". If you can't afford the fee but would like to attend, apply for a scholarship here QuantUniversity's "Analytics for a cause initiative. Machine Learning in 30 minutes! Sri Krishnamurthy, CFA, CAP is the founder of QuantUniversity.com, a data and Quantitative Analysis Company and the creator of the Analytics Certificate program and Fintech Certificate program. Sri has more than 15 years of experience in analytics, quantitative analysis, statistical modeling and designing large-scale applications. Prior to starting QuantUniversity, Sri has worked at Citigroup, Endeca, MathWorks and with more than 25 customers in the financial services and energy industries. He has trained more than 1000 students in quantitative methods, analytics and big data in the industry and at Babson College, Northeastern University and Hult International Business School. Sri is leading development efforts in creating a platform called QuSandbox for adopting open source and analytics solutions within regulated industries. QuantUniversity is a quantitative analytics and model risk advisory based in Boston, Massachusetts. QuantUniversity runs various data analytics workshops in Boston, New York, Chicago, and online. The company offers an Analytics Certificate Program and is launching the Fintech Certification program in Fall 2018. The Stephen D. Cutler Center for Investments and Finance is provides programs and cutting-edge resources that enrich the student learning experience, support faculty research, and engage our alumni community. We’re committed to furthering Babson’s innovative and practical approach to finance education and enabling industry practitioners, faculty, and students to collaborate and learn from one another.